Jay-Roy Grot is denied by Reading's Leandro Bacuna as he looks to score his first goal for Leeds United. Picture Tony Johnson. 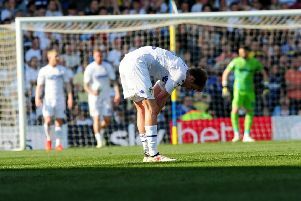 Pablo Hernandez saw an injury-time penalty saved as Leeds United’s unbeaten home record under Thomas Christiansen was ended by Reading. The Whites were handed a late lifeline when Samuel Saiz went down in the box, but Reading keeper Vito Mannone came up with a save from a poorly struck spot-kick to clinch a 1-0 success for the visitors to Elland Road. Much of the action in a disappointing match came in the last 15 minutes with Reading scoring a controversial goal through Mo Barrow, who was on loan at Leeds last season. Leeds, looking to bounce back from two straight defeats, started sluggishly and their only effort of note in the first half-hour was a weak header by Pierre-Michel Lasogga from an Hernandez cross that was flicked on. Reading offered little either early on, although Roy Beerens curled a shot wide from the edge of the box. Lasogga saw a shot flash wide from the edge of the box and Luke Ayling sent a wild effort out for a throw-in as the action hotted up slightly towards the end of the half. The visitors created the first good chance on 34 minutes when Jon Dadi Bodvarsson turned well to get inside the box and tried to chip home keeper Andy Lonergan only to see his effort saved. A minute later Lonergan made a better save to tip away Sone Aluko’s low shot. Leeds created one more dangerous moment in the first half, but Lasogga could not quite reach Hernandez’s cross and it was not really a surprise that the half ended goalless. Both teams got shots away early in the second period, Eunan O’Kane curling a shot just wide from the angle of the box and David Edwards shooting well over at the other end. Bodvarsson sent a near post header over from a corner and Leandro Bacuna shot over from the edge of the box as Reading were edging the play. Leeds, for all their possession, were struggling to create much until the 70th minute as Lasogga headed over after finding himself unmarked from a corner. O’Kane then made a great run through midfield only to shoot over from 20 yards. Reading sub Barrow almost made a quick impact for his team as he fired in a well struck shot that was superbly tipped over by Lonergan. The game really livened up as Saiz got clear on the right and rolled the ball across for sub Jay-Roy Grot only for Bacuna to get back and prevent the striker from getting a shot away. The ball was played straight back in only for Jansson to blast the ball way over from a great position in the box. United were made to pay for the miss soon after when an obvious looking foul on Hernandez on the touchline was allowed to go unpunished by referee Jeremy Simpson and Barrow was quickly played in behind Ayling to confidently send the ball past Lonergan for what proved the winning goal. Kalvin Phillips sent a volley over as Leeds looked to hit back and they were given a great chance in the first minute of injury-time as Saiz went down in the box under a challenge by Liam Moore. It did not look like a clear foul, but the referee, perhaps,making up for his earlier apparent error, pointed to the spot. Hernandez has put his previous penalties away for the Whites, but this time could only kick the ball straight at Mannone and the points had gone. Disappointed Thomas Christiansen felt his side deserved something from the game. “We have to continue and work hard. “We were too slow in the first half, but we learned for the second half and created more opportunities than Reading. “We deserved more from the game. We deserved at least not to lose. Leeds: Lonergan, Ayling, Jansson, Cooper, Berardi (Dallas 89), Roofe (Sacko 68), O’Kane, Phillips, Saiz, Hernandez, Lasogga (Grot 78). Reading: Mannone, Bacuna, Ilori, Moore, Gunter, McCleary, Edwards, Van den Berg, Aluko (Kelly 72), Beerens (Barrow 66), Bodvarsson.